Chou Chou! Adventures of a Briard Girl : I Am A Therapy Dog! 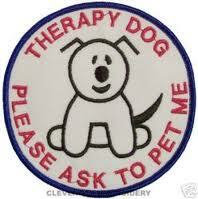 I Am A Therapy Dog! After completing a shadow visit, an evaluation, and 6 probationary visits to nursing homes and libraries, Chou Chou and I are a certified animal-assisted therapy team! Chou Chou is showing off her new ID tag. I have a tag, too. I was awarded our certificate tonight at the monthly meeting. I am excited about the opportunity to do this! We visit along with other teams. There are many different types and sizes of dogs; some cats, and rabbits can be therapy animals, too. It's so much fun to do this with Chou Chou that it's easy to forget these visits can be healing; it is truly volunteer therapy work, bringing comfort to elder people and helping children learn to read with confidence. There are some staff and clients at nursing homes who don't like dogs or fear them, and we are careful to steer away from them. But most people look forward to the monthly visits with the dogs. As they stroke Chou on her head or side, they talk about the dogs they once loved, and for a moment, their memories bring back happier times. One woman stopped me in the hallway of the nursing home and asked to pet the cute puppy. Chou sat for her. The woman said she was in rehab because of an accident; she smiled and said, "I am a dog person. Can you tell?" She described her dog, who used to sit on her lap not long ago. And then tears came to her eyes as she told me that after she was forced to leave her home, someone took her dog to the shelter; "I worry so much about him. I think he misses me like I miss him. What will happen to him? Maybe they will put him down." I told her about my friends who have adopted dogs from the shelters -- wonderful dogs who went to wonderful, loving homes. Chou Chou's BFF, Toffee, is one such lucky dog. The woman seemed comforted by this knowledge; she pet Chou, told me stories about the dog she loved, and finally a smile lifted her sadness. There are many facilities on the waiting list for animal-assisted therapy services and not enough volunteers. If you have a well-trained, gentle dog or cat or rabbit, why not consider volunteering as an animal-assisted therapy team?